One of the most important dates in the Catholic calendar is almost upon us, and in Francavilla Fontana, the rites of the Holy Week are not only symbolic, historic and steeped in tradition, they are a must see ritual that bewilders all onlookers, even the locals. Here are all the important dates and times of the Holy Week Processions, with a brief description of each. This article was originally posted by Francavilla Fontana Tourist Information and adapted by Puglian Pleasures. Traditionally people go to ‘Chiesa Madre’ (the largest and most important church – Mother church) in the morning, carrying palms over their shoulders. 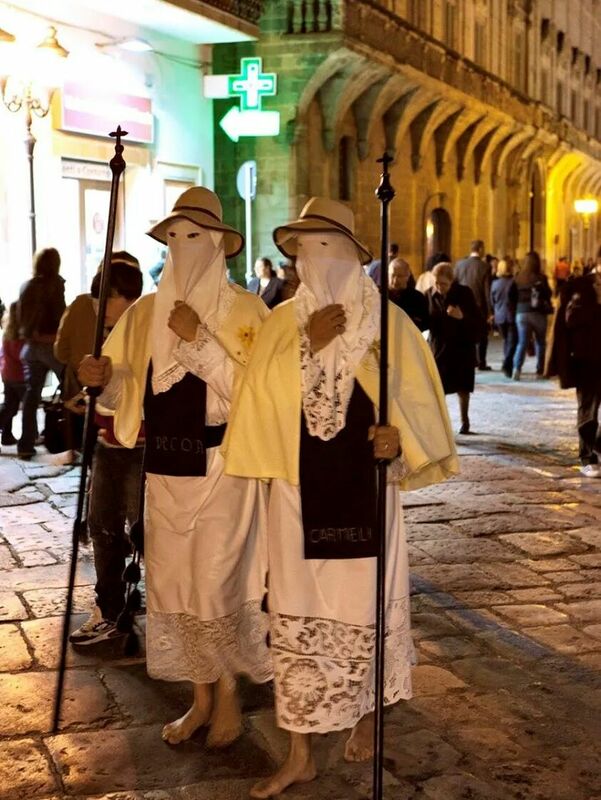 The pilgrims, wearing long white gowns and a hooded mask which completely covers their head and face, begin the procession from their own Church and move throughout the town in pairs. Along the way they sing an ancient song: “The sore sinner”. 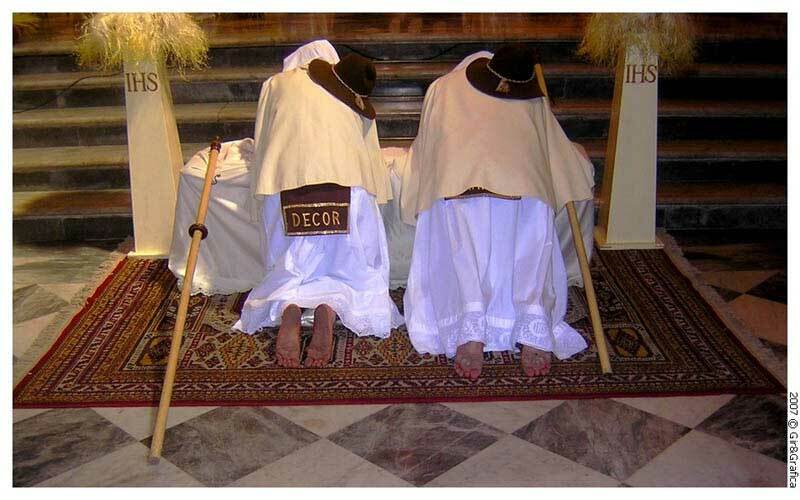 After the service the pilgrims remain masked and return to the Church of the ‘Madonna del Carmine’. This time, happily singing another song called “What a blessed day”. This is the first appearance of the ‘Cross of the Mysteries’, bearing symbols of the Passion of Christ which opens the Holy Week of processions. The Congregation of Madonna del Carmine enjoys centuries of tradition, performing the pilgrimage to the churches of Francavilla. The hooded pilgrims, go barefoot, throughout the town in pairs, and enter Via S. Francesco, they go to church to worship the Eucharist. They will remain on their knees, until the arrival of another pair of pilgrims. They make themselves known by beating the floor with a wooden baton. The pilgrims who have just entered the church, kneel in front of the altar and the other pilgrims, continue their pilgrimage to the next church, where the sequence is repeated. The pilgrimage is done according to a precise route. When passing through the central square the arrival of each pair is greeted by two trumpeters playing a funeral March, which has been passed down for centuries. The high point of the Holy Week is the ‘Processione di Misteri’ (Procession of the mysteries). People travel from miles around to attend, and it is the largest in the area. The Church of Santa Chiara and the large square in front of ‘Chiesa Madre’, called Piazza Giovanni XXIII, is filled with crowds of people anxiously awaiting the appearance of various statues decorated with flowers. 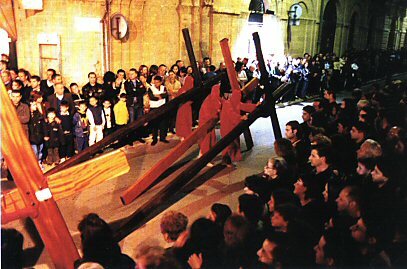 Each one is a brilliant piece of artwork representing stages of the passion and death of Christ, carried by the pilgrims, and accompanied by somber music. One even shows Christ after being whipped and dripping with blood. Then, there are the bare-footed cross-bearers ‘pappamusci’ (hooded faithful) carrying the extremely large and heavy wooden crosses. Followed by the statues of Christ on the Cross and other symbolic statues. It is a slow, long procession, which ends around midnight. After the previous days devoted to mourning and remembrance of the Passion of Christ, Holy Week takes over the joy of the Resurrection. Closing with the Procession of the Risen Christ. ← Le Rezze of San Vito Dei Normanni, Puglia.